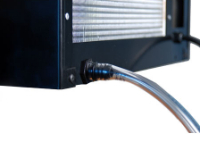 Drain line kit with 100W heating element: This kit includes a heating element that, when it senses water, will turn on and burn off excess condensate. This kit also includes the condensate fitting and a 10-foot vinyl drain line at the rear of the cooling unit to drain excess condensation. The condensate fitting and the 10' vinyl tube exits from the warm side, (rear), to drain excess condensation accumulated during the cooling process. No additional delivery charge if ordered with your Cellar Pro cooling unit.